Worked with the Norwegian Goelogical Survey in Norway and with the US Geological Survey in New Mexico, Montana & Alaska. Involved in the photo and tescopic mapping of the moon with the USGS’s Astrogeology Center in Flagstaff, Arizona under the direction of Dr. Eugene Shoemaker. 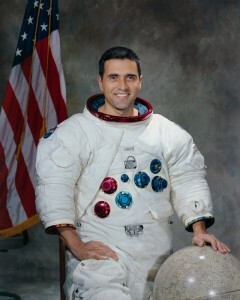 With Shoemaker’s urging applied for the first group of NASA scientist-astronauts and was selected by NASA in June 1965. Following selection, attended a 53 week course in flight training at Williams AFB, Arizona, earning his USAF pilot’s wings and USN Helicopter pilot wings in 1966. Provided Apollo flight crews with detailed instruction in lunar navigation, field geology and feature recognition. 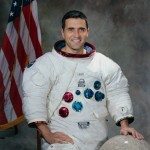 Reassigned from Apollo 18 prime crew (when the mission was cancelled) to Apollo 17 prime crew, replacing Joe Engle. Became the last man, and the first scientist to walk on the moon during Apollo 17 in December 1972, spending three days in the valley of Taurus-Littrow with Apollo 17 CDR Gene Cernan. Resigned from NASA in 1975 to run for the US Senate and was elected as the Republican Senator from New Mexico in November 1976, serving one six year term before losing his re-election bid in 1982. Following his Senate term Schmitt became an independant consultant in science, technology and public policy in Albuquerque, New Mexico as well as accepting numerous public speaking opportunities.